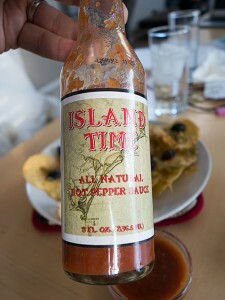 I’ve been enjoying Island Time’s All Natural Pepper Sauce of late. This is a solid sauce, just enough heat, and a nice complimentary flavor for any application hot sauce could be used for. I suggest this sauce for nachos, chips, Mexican dishes, chili, or even spicing up tomato sauces.